The EOS 6D DSLR camera is the ideal tool for unlocking your creative vision. 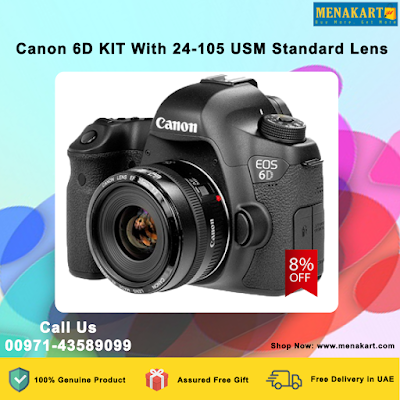 It features a 20.2 Megapixel Full-Frame CMOS sensor, a wide ISO range of 100-25600, expandable to L: 50, H1: 51200, and H2: 102400, for incredible image quality even in low light, and a DIGIC 5+ Image Processor delivers enhanced noise reduction and exceptional processing speed. A new 11-point AF including a high-precision center cross-type AF point with EV -3 sensitivity allows focusing in extreme low-light conditions, and with continuous shooting up to 4.5 fps, you are ready to capture fast action. The EOS 6D features a newly developed Canon Full-Frame 20.2 Megapixel CMOS sensor for high resolution, perfectly detailed images delivered with incredible speed and performance. With no conversion factor, the EOS 6D's sensor ensures that lenses mounted on the camera will deliver the same angle of view they would on a traditional 35mm camera.